It was this form of working class democracy that Marx regarded as the ‘dictatorship of the proletariat’ & the form that was the basis of the Soviets. Written one year before the revolution, Lenin’s book ‘State & Revolution’ deals with the experience of the Paris Commune & the nature of the workers’ state as opposed to the capitalist state & the façade of parliament as ‘representative democracy’. The Communes, Soviets, or whatever name we wish to call workers’ councils, are required to organise the workers to be able to take control from the capitalist class, & thereafter to build socialism. From the first revolution in February 1917 when the Tsar was deposed, to the October Revolution, Russia had a period of dual power. 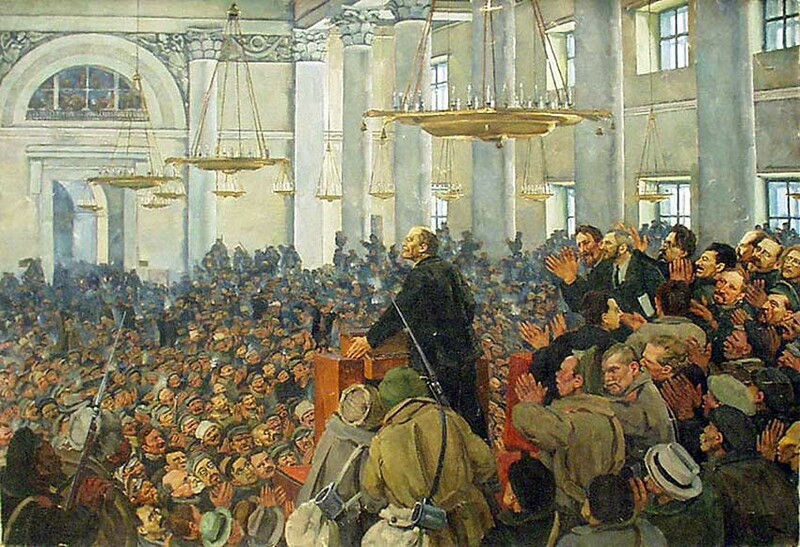 Whilst in theory political power was with the Provisional Government that was supposedly answerable to the Duma, the Russian parliament, in reality much of the power was with the Soviets. These were the institutions of working class democracy that the Bolsheviks embraced after the revolution. Unfortunately, the Russian Revolution didn’t spread & capitalist countries like Britain armed & funded the ‘Whites’ & Russia descended into civil war. The Red Army eventually won out & the experience of the Paris Commune wasn’t repeated. The problem was the economy devastated, as was the Russian working class. The workers were a minority in a backward, peasant-dominated country. Isolated, the Bolsheviks never really gave ‘all power to the Soviets’ as they promised, & retreated to the ‘state capitalism’ of the New Economic Policy to rebuild the economy. These ‘NEPmen’ were the budding capitalist class. After the death of Lenin, Stalin moved to repress this class. The forced collectivisation of agriculture was resisted by the Kulaks, the better-off peasants, who did not want to relinquish control of their land & their produce. Their battle with the Party resulted in a huge human cost with millions dying of famine. In trying to impose communism from above the ‘dictatorship of the proletariat’ became a dictatorship of the party, & the dictatorship of Stalin. Rather than dying at the hands of capitalists, many communists were executed as ‘enemies of the people’ on the orders of a paranoid dictator. Things would likely have been a lot less brutal with Trotsky as leader, but he would have faced the same dilemma of either trying to impose communism on a country not ready for it, or giving real power to the Soviets & allowing them to succumb to counter-revolution. With the massacre of the Communards being in the minds of the Bolsheviks it is likely that a Trotsky-led Soviet Union would have copied Stalin’s repression, even if not on the same scale. The experience of the Soviet Union shows us that the class struggle continues after the workers take power, as all the means of production do not fall into the hands of the workers overnight through the mere passing of a decree. They have to be physically taken control off. That requires Commune-style democracy. This period of class struggle is the ‘dictatorship of the proletariat’. It is the majority workers dictating to the minority capitalists. Only once the means of production are fully taken control of are classes abolished. Without ownership of the means of production, either directly or indirectly through investments, there are no capitalists & therefore no class for workers to sell their labour to. Work, labour time, is not allocated by market forces but by a plan collectively & democratically decided upon. This classless society of communism Marx foresaw as having two stages. The lower stage whereby the means of production are commonly owned & controlled, but where entitlement to means of consumption is largely based upon time worked; & a higher stage of communism where work has become life’s prime want, where the division of labour is broken down so people can do both rewarding tasks as well as sharing the more unpleasant & mundane jobs, & most importantly where the entitlement to means of consumption is based upon need, hence the principle of ‘from each according to his ability, to each according to his need’. All these stages, & even the seizing of power require communes, the form of working class democracy. It is not a false choice of an armed uprising at one extreme & the peaceful legislating into being of communism by a parliament. Class struggle requires working class organisation outside of parliament as well.